Photos and words by Irie Langlois. Nestled beside the flowing stream, in a small valley between mountains, this place is a certain kind of paradise. The women smile and shriek “Julley!” in their voices, so shrill and so bright as they walk past me sitting on my rock. The goats whinny, there’s a permanent smell of dung that wafts through the air. The yaks lazily wait around to be called in the misty morning light that slowly peeks over the peaks. There’s a gentle stream of smoke escaping from the chimneys of our nomads tents as the prayer flags blow in the icy breeze. There are no rainbows today, but I know the mountains are smiling. Ladakh is a magical place, embedded in the mountains at the core of the Trans-Himalaya. The Indus River rising in the interior of Tibet flows from the east to the centre of Ladakh, and streams further into Pakistan. A natural wonder that links three separate countries to remind us that the Earth is whole. 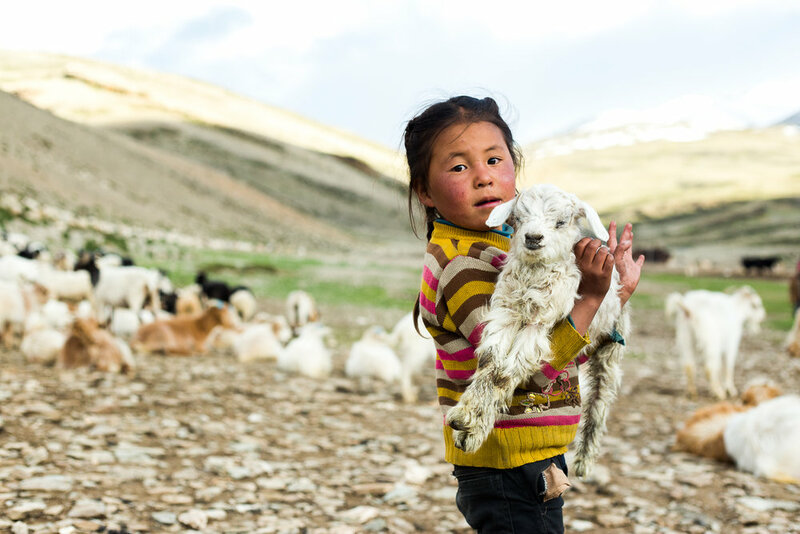 We’ve begun a journey in Ladakh, with a purpose to document the last remaining generation of nomads who dwell in the Tibetan Plateau. The journey began as a documentary project, but has quickly become a voyage far flung from the confines of filmmaking. It’s grown into something far greater than capturing a story. For us as travellers, as artists, as humans, it’ s become a way to reconnect with nature and with the earth. It’s become an opportunity to showcase the human spirit and give voice to a special tribe – The Changpas of the Tibetan Plateau. The mysteries of the mountains, intensity of the freezing desert, the boundless splendour of grasslands stretching beyond the horizon, The Plateau, the Himalayas are landscapes that exhilarate the senses. The icy wind, whips across the open plains and allows for the detachment of the coverings we unknowingly carry from the modern world, ones that have always prevented us from completely aligning with nature. From now, until the summer rolls around next year, we’ll spend time in the plateau each month. We’ll rise with the sun and work until the moon has risen to the heart of the night sky. We’ll drink Tibetan salt tea and eat fresh yak’s curd with the families who will shape our film. We’ll wander through the mountains and the valleys; we’ll follow the herds that graze way up on high pastures. We live like our nomads in hopes that we tell their story with truthfulness and with grace. Photos were taken in Ladakh, India.